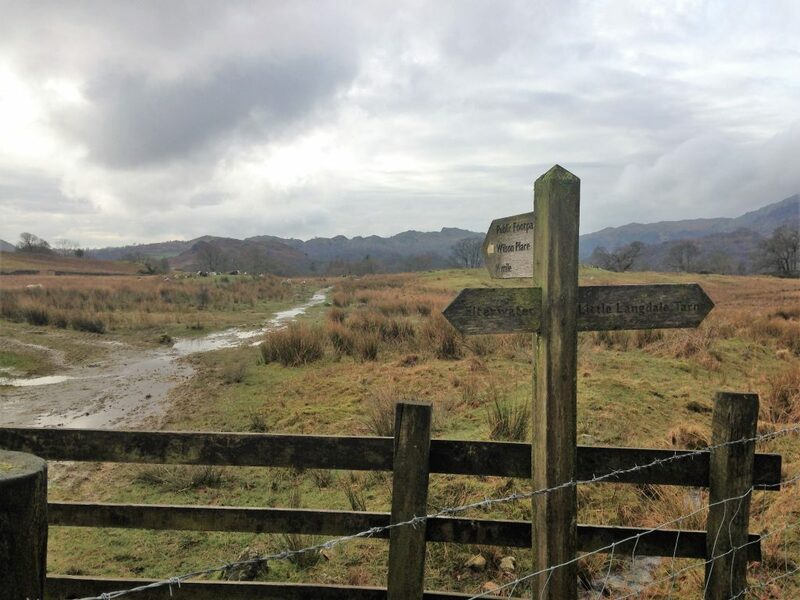 A six mile circular walk around Elterwater, Lake District. 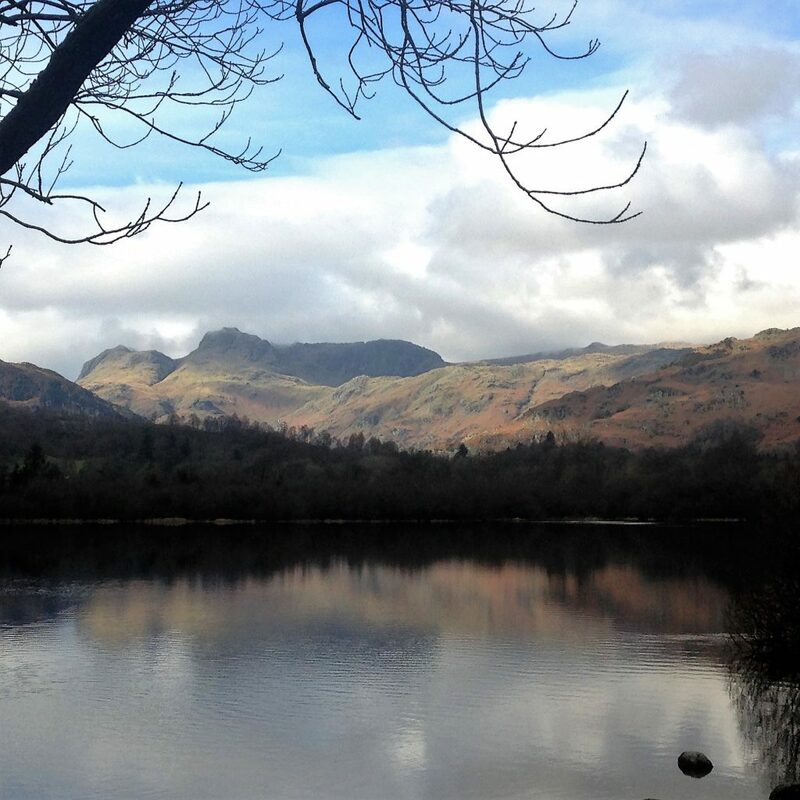 The village of Elterwater is pretty as a picture. It’s a hamlet centred around a small but quaint village green. On the far side the picnic tables outside the Britannia Inn entice the visitor to stop, rest and venture in for refreshments. It was only mid morning so we resisted. Besides, we were visiting Elterwater village to walk round Elterwater itself. 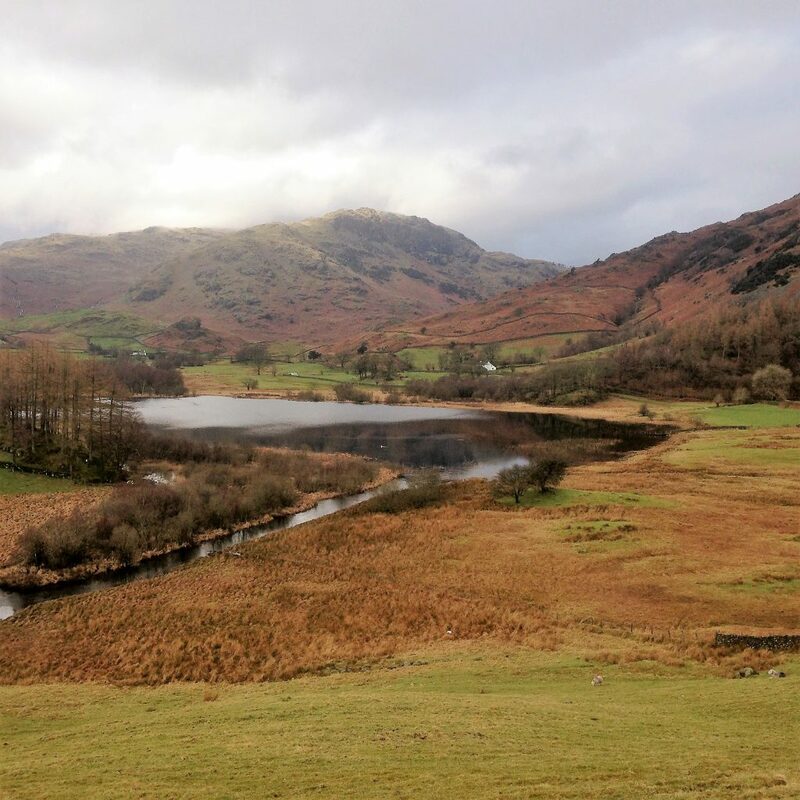 We parked up in the National Trust car park in the village and headed off on an ambling six mile route taking in woodland, farmland, waterfalls and superb views of Little Langdale tarn and Elterwater itself. From the car park we turned left down the road. We were soon presented with an option to leave the road and follow the track to the right. The sign post for cyclists suggested we were taking the ‘challenging option’. As the path rose, our legs soon felt the pull of its sharp incline… we began to wonder whether we’d taken on more than a gentle stroll. The climb was short though, and our track soon levelled off. We ignored options to leave the track and followed our noses as we began to lose height. The views opened up as we headed towards the tiny hamlet of Little Langdale. After reaching a crossroads we followed the signs for Slater Bridge. Our pace dropped as we took in magnificent views to our right. Looking westwards, down the end of Little Langdale valley the tranquil waters of Little Langdale Tarn glistened in the foreground with the finely contoured Langdale Pikes standing out proudly behind it. 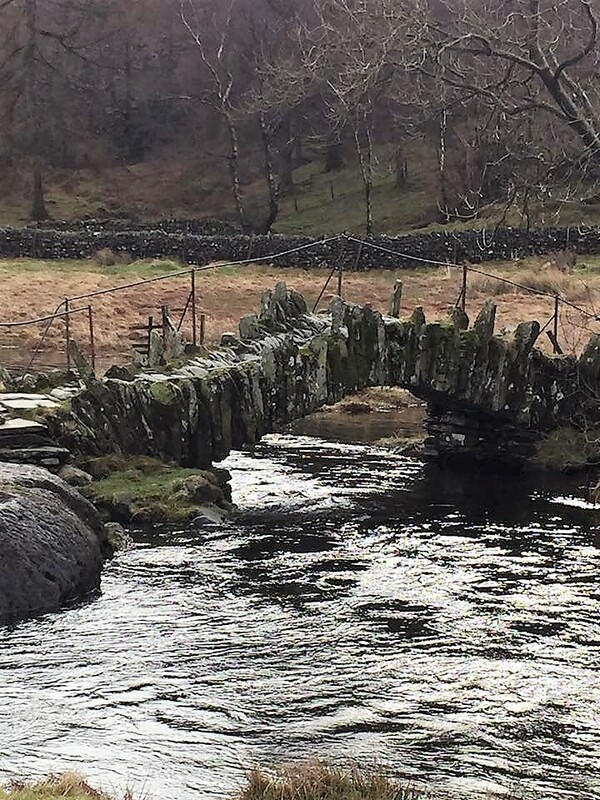 We soon reached Slater Bridge, an ancient footbridge that crosses the River Brathay. With its classic rounded shape and worn-down stone slabs it seemed straight out of Billy Goat Gruff or other fairy tales. So much so, we half expected a troll to pop up from under the arch to block our passage. Once over the bridge we climbed a short distance and then followed the path to the left, loosely following the river downstream. At a three-way fork we kept close to the riverbank and followed the sign to Colwith. Sometimes on a track, sometimes on a path, our route took us through woodland and past farmhouses at Stang End and then High Park. At High Park we passed through the farm buildings and then kept left, following a course which kept us within shouting distance of the river. The sound of the river grew stronger before we rejoined the riverbank at Colwich Force, where the water roared impressively as it dropped and gushed through wooded rocky narrows. The path then met up with a road where we turned right and then quickly picked up the footpath to Skelwith Bridge on our left. Before reaching the bridge we passed pleasant woodlands and open fields to Low Park and then Park Farm. 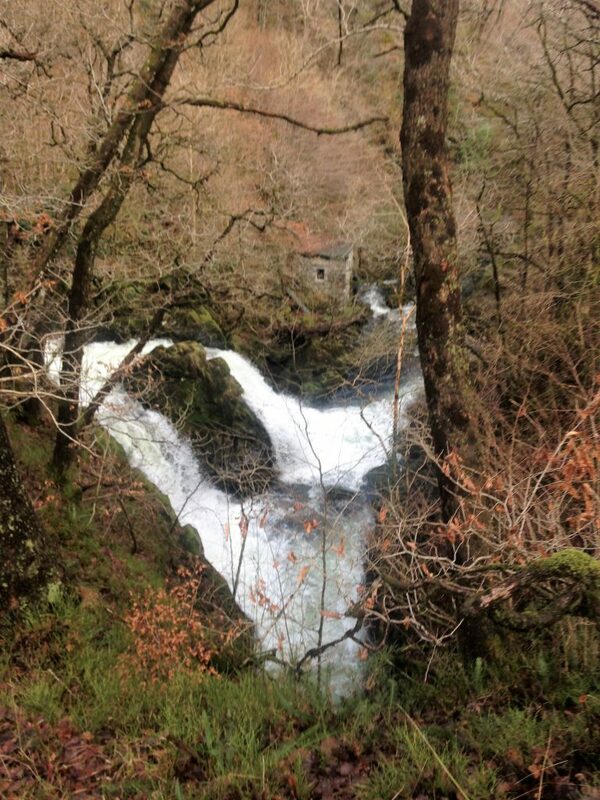 We then followed our noses as the pathway led us past Skelwith Force, another impressive waterfall. Skelwith Bridge wasn’t much further. 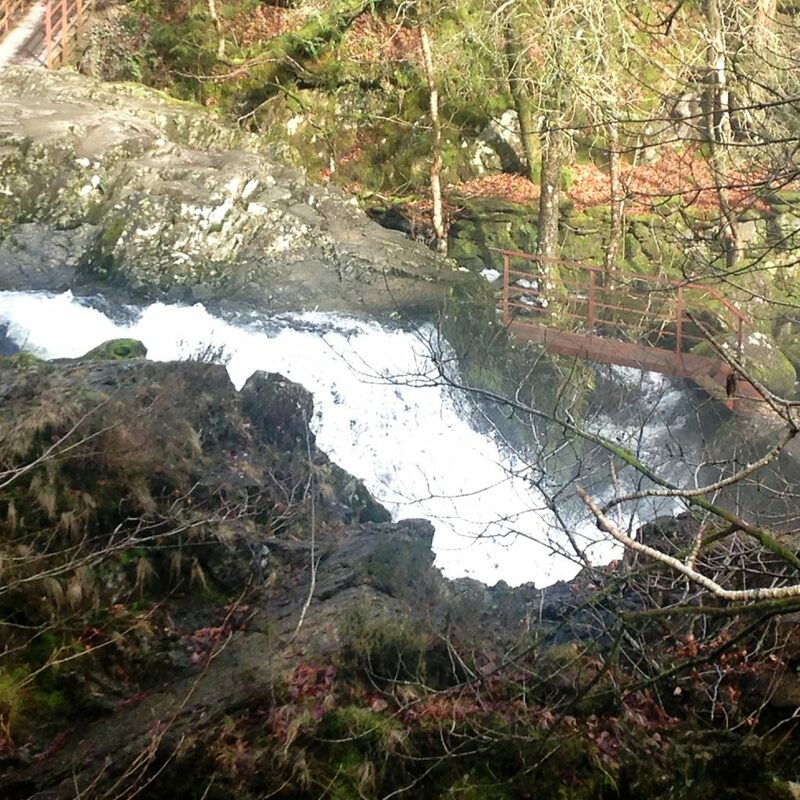 After crossing the bridge we turned left, following a signposted path to Elterwater. The route was now flat and easy as we headed along a pleasant slabbed pathway that followed a river upstream towards Elterwater. With the lake itself now in sight, views of the Langdale Pikes were majestic as we looked down the valley ahead of us. 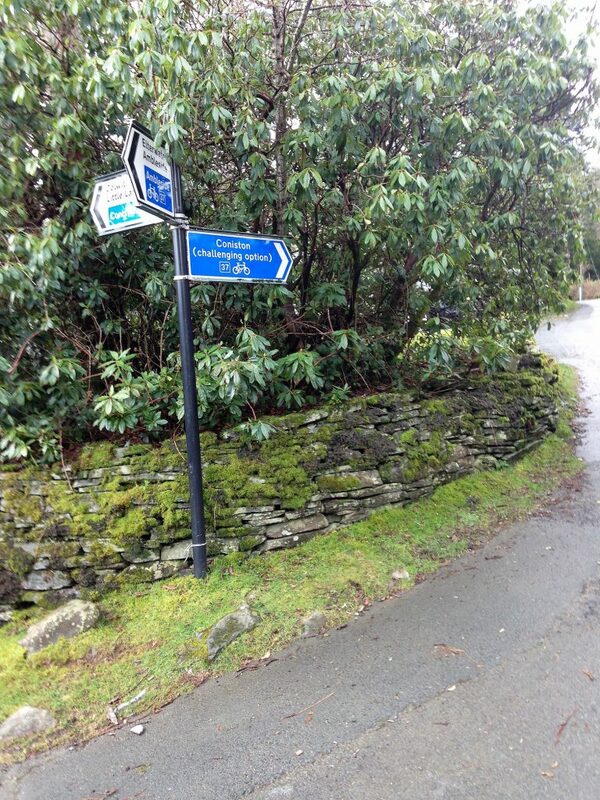 The pathway took us to the right of the Elterwater then back into the Elterwater village itself.